BRADBURY'S LUCK (AUS) (Grey 2002-Stud 2006). 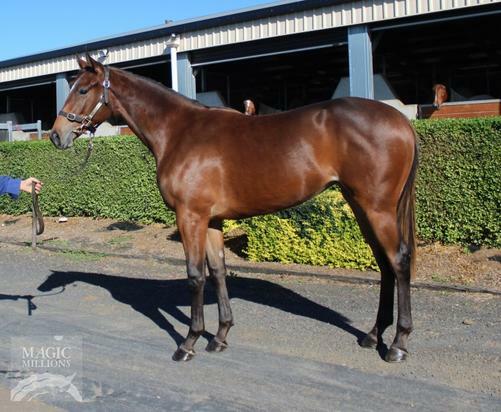 2 wins at 2, GCTC Magic Millions 2YO Classic S., RL. Sire of 355 rnrs, 233 wnrs, inc. SW Luckygray (WATC Railway S., Gr.1), Fire Up Fifi, Col 'n' Lil, In Cahoots, Cash Luck, Elegant Composure, Avaladyluck, She Can Skate, Ringa Ringa Rosie, SP Unimpeachable, Goldslick, Skating on Ice, Make My Own Luck, Skate to Paris, Chewychop, Sunshine Rhythm, In a Tangle, King Utah and of Rising Luck, etc. EL OF A TIME, by El Moxie. 5 wins to 1250m, A$109,775, ATC Metro Petroleum H., Canterbury Park H., 2d ATC Cellarbrations Scone H., 3d ATC XXXX Gold H. Dam of one named foal. El of a Time. 5 wins. See above. Admiral's Watch. 3 wins from 1250m to 1600m, SAJC Blackwell Funerals H., Provideo H., Betfair P., 2d SAJC Distinctive Homes H., Allan Scott Park Morphettville H., 3d SAJC Tooheys 2YO H., Become a Member H., Simply Containers H., Schweppes H., Honourable Jack Wright AO Memorial H.
SIKESTON (Lear Fan). 11 wins at 1600m, 2000m, £130,009, 150,000fr., 1,043,200,000L., Rome Premio Parioli, Gr.1, Milan Premio Vittorio di Capua, Gr.1-twice, Gran Criterium, Gr.1, Rome Premio Presidente della Repubblica, Gr.1-twice, Premio Roma, Gr.1, Curragh International S., Gr.2, Royal Ascot Queen Anne S., Gr.2, Rome Premio Ribot, Gr.2, Premio Natale di Roma, Gr.3, 2d Phoenix Champion S., Gr.1, Longchamp Prix d'Harcourt, Gr.2, Rome Premio Ribot, Gr.2, 3d Premio Roma, Gr.1, Royal Ascot Queen Anne S., Gr.2, Milan Premio Emilio Turati, Gr.2, 4th Goodwood Sussex S., Gr.1, Longchamp Prix Ganay, Gr.1. Sire. Tick By (Zabeel). 4 wins from 1500m to 1700m, A$155,425, VRC Henry Buck's P., KA Morrison H., 3d Queensland Oaks, Gr.1, VRC Paris Lane S., L. Producer. GURU-GURU (Faltaat). 4 wins at 1600m, 1900m, S$281,811, to 2017, Singapore TC New Year Cup, L, Good Luck S., Kranji D S., 2d Singapore TC El Dorado Classic, L.
THAT TAT (Faltaat). 17 wins to 6½f, US$602,430, Lone Star Park Turf Sprint H., L, Ford Express S., L, Louisiana Downs Island Whirl H., L, 2d Lone Star Park Ford Express S., L, 3d Oaklawn Park Count Fleet Sprint H., Gr.3. HIGH TIMER (High Brite). 15 wins-2 at 2-to 7f, US$229,996, Sam Houston Park Blue Water S., L, 3d Sam Houston Sprint Championship H., L.
OKIE TIME (Mutakddim). 5 wins from 6f to 8¼f, US$230,292, Remington Park Silver Goblin S., L, Prairie Meadows Iowa Stallion S., L, 2d Fair Meadows Route 66 S., L, Will Rogers Downs OTA Classic S., L, 3d Remington Park Oklahoma Classics Sprint S., L-twice. Dynaboy (Dynaformer). 9 wins at 7½f, 1m, 2d Remington Park Wiley Post H., 3d Retama Turf H., L.
OKIE RIDE (Candy Ride). 16 wins from 5f to 8¼f, US$791,561, Remington Park Oklahoma Classics Sprint S., L-4 times, Silver Goblin S., L-3 times, 2d Remington Park David M Vance Sprint S., L, 3d Remington Park Sprint Cup, L.
OKIE NOVA (Cavvy). 2 wins at 6f, 7½f, Remington Park Ladies on the Lawn S., L, 2d Remington Park Oklahoma Classics Distaff Turf S., L, 3d Remington Park Oklahoma Classics Distaff Turf S., L-twice, 4th Remington Park Oklahoma Classics Distaff Turf S., L.